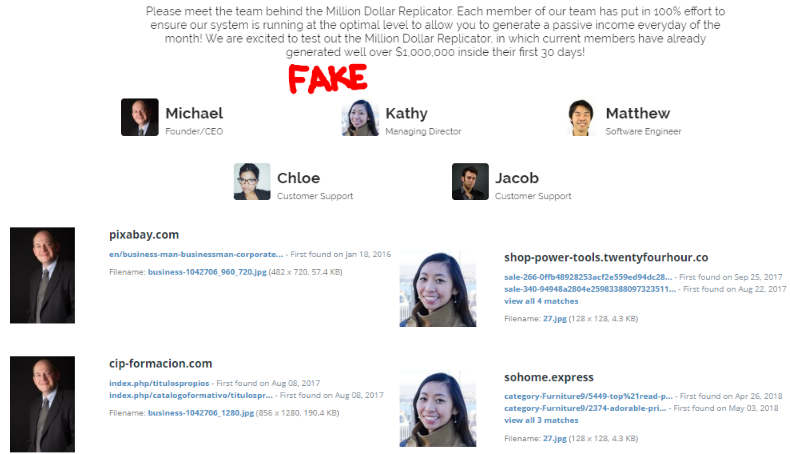 Million Dollar Replicator Review - A Million Dollar Scam EXPOSED! 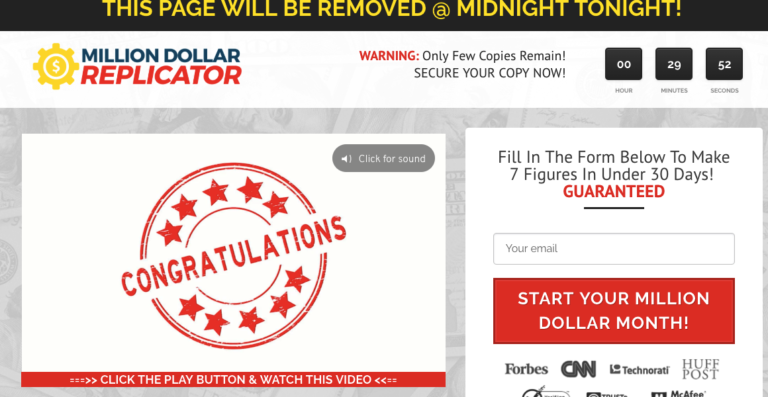 →Million Dollar Replicator Review – A Million Dollar Scam EXPOSED! 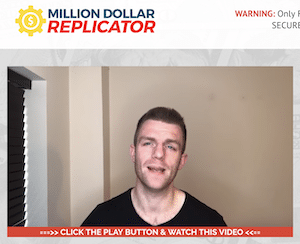 Million Dollar Replicator Review – A Million Dollar Scam EXPOSED! 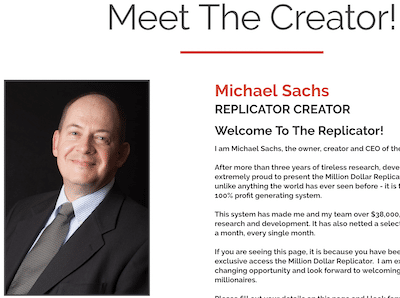 Welcome to my Million Dollar Replicator review! I've reviewed a lot of systems that turned out to be scams, and I can immediately tell from the name that a program is definitely up to no good. A good example of that is Million Dollar Replicator. Let me be completely transparent with you, I'm not associated with Million Dollar Replicator in any form. 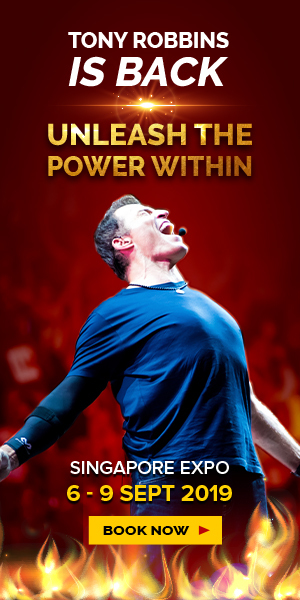 Instead, I'm here to reveal why this program is an outright scam and why it's not going to help you earn a million dollars. 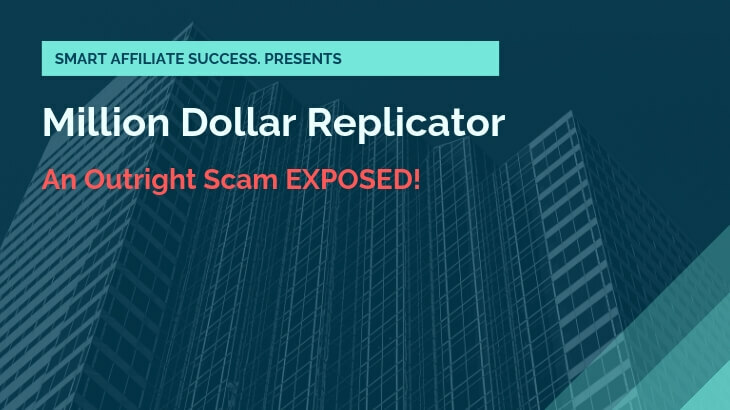 Summary: Million Dollar Replicator is an outright scam because on top of having no information about their products or their real owners, they are using fake success stories and video testimonials to reel in people. And I have proof that they are hiring paid actors and using stock photos! Who's Million Dollar Replicator For? Million Dollar Replicator Ugly Truths Revealed! What I Like About Million Dollar Replicator? 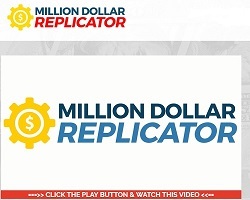 Million Dollar Replicator is a ClickBank product that follows in the many footsteps of other low quality products that I’ve reviewed last year. This is not to say that all ClickBank products are out to get your money. Believe me, there are a few ones out there that are decent enough. But with a program like Million Dollar replicator, it doesn’t actually deliver what it promises. 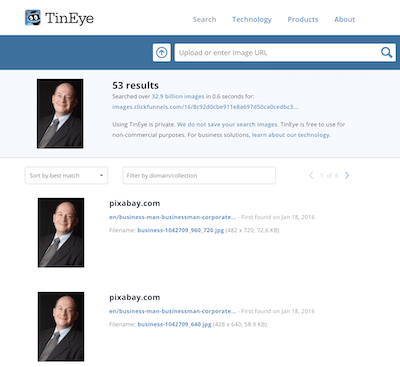 Now on the homepage, the first thing you’ll notice is that there’s no information about the product or system. Instead you’re greeted with a video of a spokesperson, most likely the founder, and goes by the name of Michael Sachs. The owner promises that you’ll get rich quick without doing any real work. But unfortunately, there’s no business or system out there that works that way. Million Dollar Replicator functions like any other get rich quick scheme out there. The owner will tell you of a system or an exploit that allowed him to earn millions of dollars without doing any real work. He might’ve told you about a sob story of how he was fired from his day job, or how he got tired of the rat race, and now he’s on a journey to finding financial independence. Upon discovering the “system” and making sure that it works, he then shares it to you and the others… For a price. On their site, it also shows that you’ve been “specially selected” from the many people who have seen the page, and now your clock is ticking. You’re now pressured to purchase the system because slots are limited. But then again, are the “limited slots” really “LIMITED”? I don’t think so, right? I mean, if you’re an affiliate marketer trying to sell your product or program, you want to get the greatest number of sales possible. That’s not the case with Million Dollar Replicator. They are pressuring people into purchasing an unknown system that dangles a shiny object in front of them. Truth be told, there’s nothing inside the program that can help you in any way. I would assume that it might be an affiliate marketing platform or system that allows you to earn passive income, but that’s not really the case. And based on their website, there’s really no other information about the product at all. All you will see are video testimonials from people who “supposedly” succeeded in this program and some convincing sales pitches from the creator. What’s It Cost To Join? It only costs you $37 to join the program, and then you’ll be met with the upsells after you’ve made the payment. 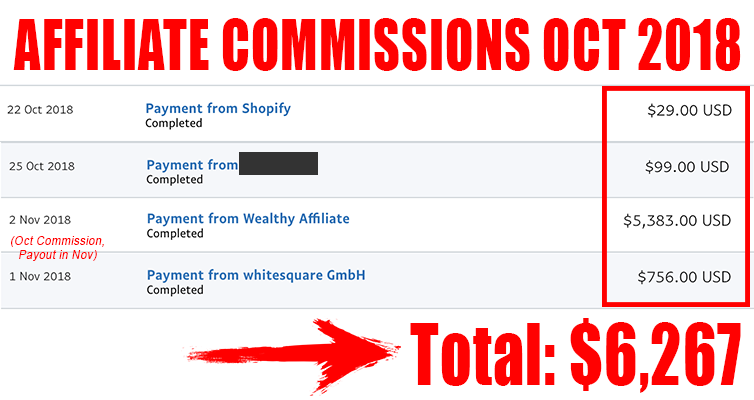 The upsells cost around $400 or more because based on what I read, their affiliates earn about $450 per sale. Now, if you think there’s money to be made with this system, you’re dead wrong. You’re basically just trying to sell something cheap then surprise them with a more expensive product. And just like the main product, there’s not enough information about the upsells except the fact that affiliates can earn “$450 per sale”. 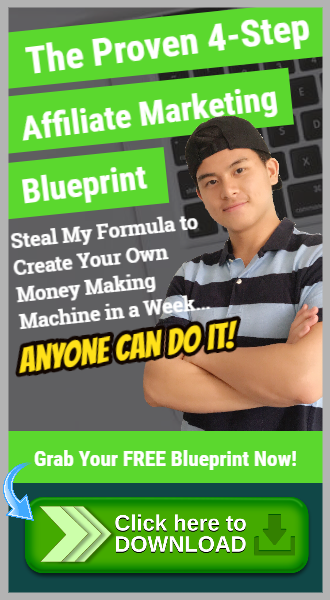 There's absolutely no one that I would recommend this program to, and that's because the program is an obvious scam and is not being 100% truthful! 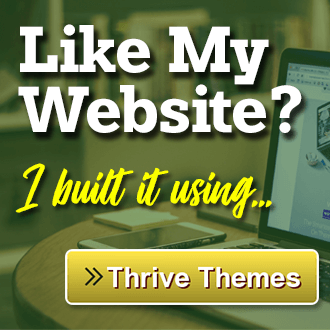 #1 – It’s An Obvious Get-Rich-Quick Scheme! Let’s be honest here. Any program or system that contains the word “system”, “millionaire”, “income”, and “cash” are all red flags for me. Here are some examples: Cash Siphon System, Home Income System, and Free Ad Cash System. Obvious claim is so obvious! In simpler terms, I’m able to judge if a program is legit or not just by the name itself. And sure enough, I was right to assume that Million Dollar Replicator is not a legitimate program. The program promises to make you rich by helping you earn 7 figures in under 30 days, and that sounds very unrealistic. It is also programs like these that get affiliate marketing a bad reputation. And if you don’t know where to start, I would invite you to check out my step-by-step guide on affiliate marketing. #2 – No Information About The Owners! Just like the product, there’s no information about the real creator of Million Dollar Replicator. And no, Michael Sachs is not the real owner. He’s a made-up character that the real people behind the program created. This is so they don’t get to use their real identities. Here’s the real Michael Sachs! The team of experts that’s supposedly running and developing the system, as seen in the picture, has nothing to do with the program. #3 – Fake Testimonials With Proof! Not only are the owners fake, but the video testimonials of successful customers too. 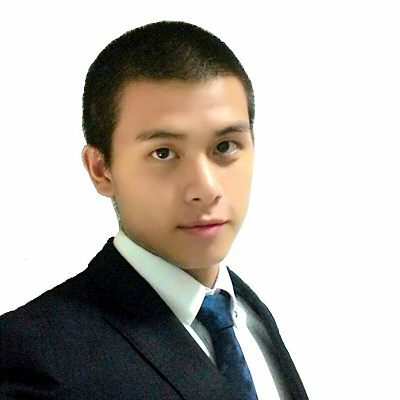 This is the first guy that you’ll see on their testimonials. 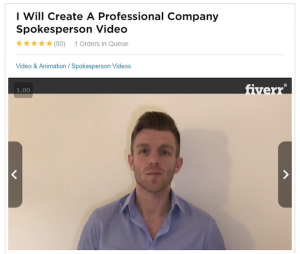 In reality, he’s just a paid actor from Fiverr who you can pay to create spokesperson videos. And not only that, there’s a whole bunch of written testimonials from other members who don’t exist. Now again, this is a common tactic used by marketers who want to reel you in with the promise of getting you rich. And there’s no better way to do that than to show average folks are successful at making a lot of money. #4 – Limited Slots Is A Lie! This is a common marketing tactic that’s used by marketers to force people into buying without thinking. These people will always want your money ASAP, and they’ll never put a limit to the amount of money they can make. So if you see another marketing system that says “limited slots”, it’s most likely a lie. Everything about the system is secretive and anything but honest. There’s just absolutely nothing worth good mentioning about their program at all because it’s an obvious scam. Yes, without a doubt. There are a lot of red flags that were raised when I reviewed this program, and I am not even going to start with their name. They don’t have any real and honest information about their product or system, which is the first red flag. This leads me to believe that they actually don’t have anything concrete to sell you. Next, the owners and the team of experts are obviously not real people, which is the second red flag. This is more than enough for me at this point to stop wondering if they continued to lie more about their product. 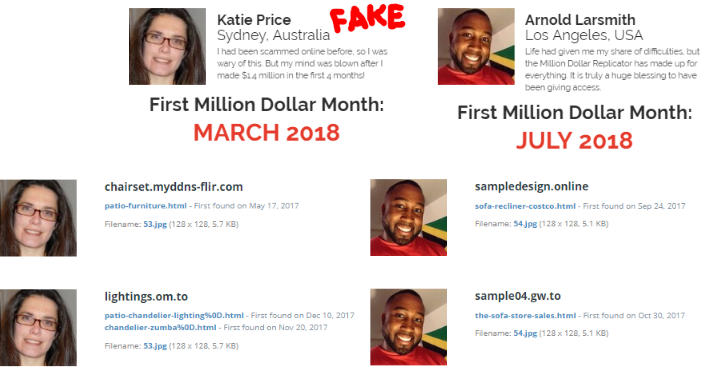 The testimonials and success stories are also fake. They paid actors and used stock photos to make us think that ordinary people made millions of dollars in less than 30 days.